One of the basic tools that every hair salon should have is alligator clips. They have so many different uses and always come in handy when you’re doing your client’s hair. Apart from salon use, alligator clips are also great for home use and any girl who likes to take care of her locks and make different hairstyles. Alligator (or crocodile) clips got their name because their design is similar to alligator teeth. That is an important feature because that means they grip tightly onto the hair and hold it in place. Made out of a strong plastic material, AiryHair clips are sturdy and last for a very long time. The surface is resistant to any kind of water damage or rusting. The clips are colored black which makes them very neutral and simple. What is also great about our alligator clips is that they are so easy to use. You simply need to press on the ends and the clip opens up. Then you slide it into the hair and release which will close it. The clips also have small circular indentations which fit your fingers perfectly. That means your fingers will not slide off from the clip and it is much easier to handle. The length of the clip is 13.5 cm which is pretty long. That means that you can fit more hair in and clip a greater surface area. The alligator clips come in a set of five, which is a minimum number you should have for home use. For salons, we recommend purchasing several sets and stocking up on this amazing tool. How to Use Alligator Clips? One of the most obvious ways is to use clips as a helpful tool when creating different hairstyles. Whether you’re a hair professional and work with hair every day, or you do your hairstyles yourself, alligator clips will the make the whole process much easier. Regardless whether you’re creating a very simple look or an intricate hairstyle, you always need something that will hold your locks in place. Since our alligator clips are black, you can camouflage them easily if you don’t want them to be visible. Another simple way to use the clips is to simply get strands out of the way. If your hair is constantly getting in your face or you want to tame your messy curls, clipping is the easiest way to solve those problems. If you are a hairdresser, you probably know that alligator clips are very useful for clipping the locks that you have sectioned off, whether you’re dying the hair, installing extensions, or doing a haircut. If you want to curl your hair, you can use clips to hold your rollers. They’re especially good if your plan on sleeping with your rollers because they’re very strong and will definitely keep the rollers in place while you sleep. If you want to make your crocodile clips unique and wear them as a hair accessory, you can definitely show off your creative and crafty side by embellishing them. You can add rhinestones, jewels, pearls, bows, ribbons, and bead, by gluing them on. It’s up to you. 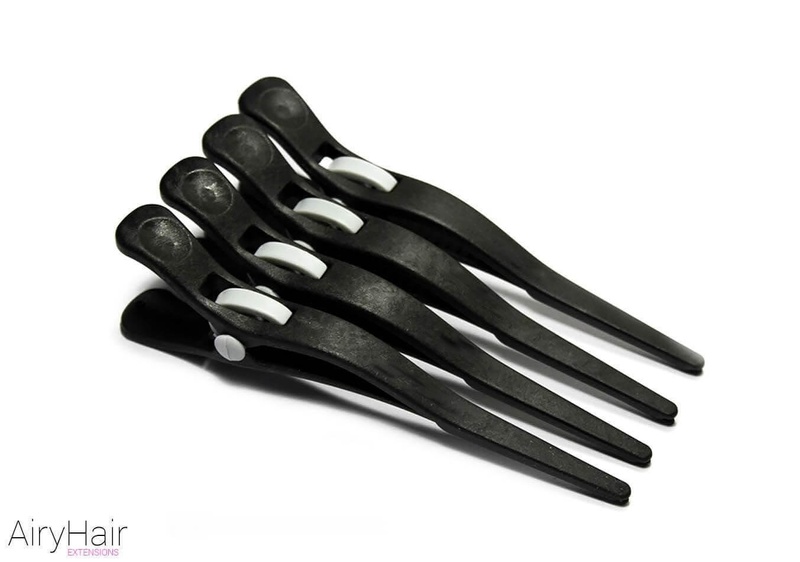 Overall, alligator clips are a must-have tool to have at home or at your salon. They will make your life so much easier! One of its many uses is using it to create awesome looks. A classic updo, also known as a French twist, is so easy to make if you have an alligator clip. It can be worn for work, dinner, date, prom, or a wedding because it’s timeless and beautiful. So prepare your clip and let’s get started! Parting your head on the side works best for this hairstyle, but it’s completely optional. Brush all of your strands back and make sure it’s free of any knots and tangles so that you’re left with really nice and smooth locks. Now you want to gather all of your locks together and the back of your neck, nice and low. And make sure that you grab all of those baby neck hairs as well. This will give you a more polished finish. Just make sure that everything is nice, tight, and smooth. Grab the base of your ponytail with one hand and start twisting it in a clockwise motion, keeping everything nice and tight. Once you start twisting it, direct your ponytail upwards and you’ll notice the French twist form on its own. Now take your alligator clip and use it to secure the twist, clipping it from the top to the bottom of the twist. If you have short locks, you’re done at this point. If your hair is longer, you will have excess hair left sticking out the top so you’re going to need to incorporate that into the twist. Here’s how you do it. What you want to do is twist the remaining strands and tuck it underneath the twist you have already created. This is definitely a little trickier the longer your strands are so you’re going to have to work a little bit harder to tuck it all in. But take your time and you will definitely succeed. Make sure to tuck everything in the pocket, including the ends, you don’t want anything poking out. When you’re finished, you can also clip the underside of your twist as well, to make it even more secured. That way, it will last for a very long time and won’t have to worry about the twist coming undone and you will also feel much freer.